Donald Kinsey Talks about Peter Tosh and Bob Marley. Donald played on Bob and Peter LP's and toured with both. So I sit down and try to work out an arrangement. And it turned out we came up with a pretty nice little arrangement and presented this to Peter. For a long time, Peter didn’t want to do the song. For whatever reasons, he wasn’t into doing somebody else’s song. I don’t know what it was. There would be a lot of other Rastamans around that would just tell him that he don’t need to do somebody else’s song. “You don’t need to do some rock and roll tune, man.” But I felt that the tune really had something in common with Peter. Peter’s from out in the country – you know what I mean? We changed a few of the lyrics around, like saying “deep down in Jamaica close to Mandeville, back up in the woods on top of the hill,” for it to really be Peter. Instead of being the leader of a rock and roll band, he’d have a reggae band. But, man, it was difficult. He did not want to do this song. And this is an example of some of the things that I contributed, in a sense, to the music. Some people felt it as being “diluting the purity of reggae.” But I don’t see it that way. And “Johnny B. Goode” was a pretty nice record for Peter Tosh. After he finally laid the vocal track, it ended up being one of his favorite tracks. 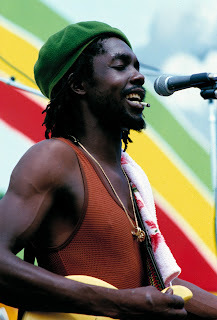 After Smile Jamaica Concert in Dec. 1976 Donald left the Wailers and joined back up with Peter. That’s when I hooked back up with Tosh, yeah. But between that I came back home and did a couple of things with the Staple Singers – we toured. I also started putting together this group the Chosen Ones – that was with my brother Ralph and Joe Thomas on bass guitar, Ron Prince on guitar, Michael Robinson on guitar. I was into guitar! [Laughs.] And eventually we had John Harris on keyboards. We recorded an EP [Don Kinsey & The Chosen Ones], but that was after I did Peter Tosh’s Bush Doctor album. I got a call from Herbie Miller, Peter Tosh’s manager. I met them up in Woodstock because they was rehearsing for the Rolling Stones tour there. The Stones really was into Peter, man. Peter was finishing his Bush Doctor album there at Bearsville Studio, and the Stones was rehearsing for the tour there. So we went up there and Robbie Shakespeare, along with Peter, was producing. That album had a couple of hot tracks on it – I kind of liked it – plus I liked the fact of being able to do some tracks with Keith Richards. He played on the album too. Did you accompany Peter Tosh on the 1978 Rolling Stones tour? Yeah. That was really great, man. I had fun doing that. Usually by the end of an album, I would end up doing the tour. We didn’t start the tour – I think the Stones was already out like a week or two before we actually started it. But that was an experience man, I’ll tell you. The first show we did was in Philly, I think. You get over 100,000 people at that big stadium. These people was there to see the Rolling Stones, man, and we was up on that stage. It was the first time I’d been in a situation on that level. We first came on, and we got a few apples up there on the stage, a few cans. This happened for about maybe 15 minutes. Mick Jagger eventually came out on the stage and he made a statement, which was really nice. He said that we was invited on this tour as his guests, and he told the people to just cool out, sit back, and get into the music. After doing that, we struck into “Don’t Look Back,” which was the record that they had did together on the Bush Doctor album. Mick Jagger was up there singing with you? Right. That tour there really exposed reggae to a wider audience. We started out with them on the East Coast, and out of the whole tour we must have did about 15 shows. Did you ever join in during the Rolling Stones’ set? Did Peter Tosh’s Mama Africa album come next? The next thing that happened was Peter was doing a tour for the Wanted Dread or Alive album, and he called me out. I didn’t play on the album, but I did the tour with him on that. Then after that we started working on the Mama Africa album, and Betty Wright was sent down to do some background vocals with us. Betty and I spent quite a bit of time together, getting the backgrounds on that Mama Africa album. Her manager knew about my background on the reggae scene, and they wanted to try to take her out of the Clean Up woman thing and put her into a more now type of situation. So her manager came up with the idea of me and Marlon Jackson coming together and producing an album with her. That was Betty Wright’s Wright Back at You album. I played on it and co-produced two of the songs. On that album, she did two of the songs that my brother and I wrote. I think it’s a real nice album, but the record company didn’t do too much with it. She was pregnant during the time, and by the time the record came out, I think she was pregnant again. The record didn’t really get too much exposure. After doing the Betty Wright album, then we went out on tour with Peter again on the Mama Africa album. After Mama Africa, I came back and we did dad’s album.